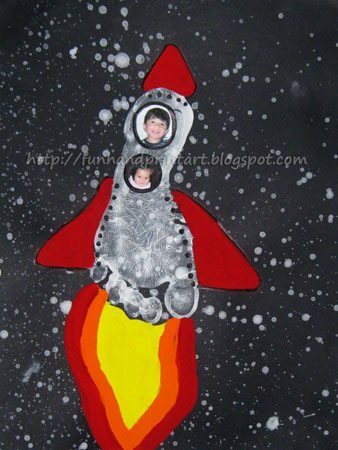 Footprint Rocket – A fun, out-of-this-world craft! 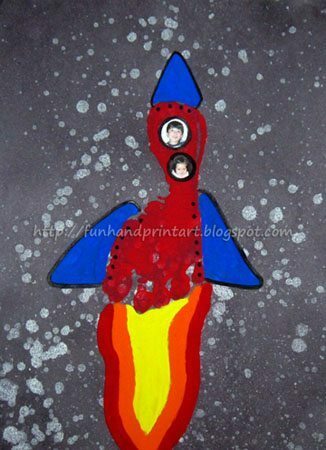 We have been busy doing outer space crafts lately and in my search for things to do, I saw this really cool footprint rocket from That’s Adorable. My 3 year old son was standing next to make and asked if we could please make it. This is my version that was inspired by hers, please check out her adorable footprint rocket as well as it is somewhat different from ours. 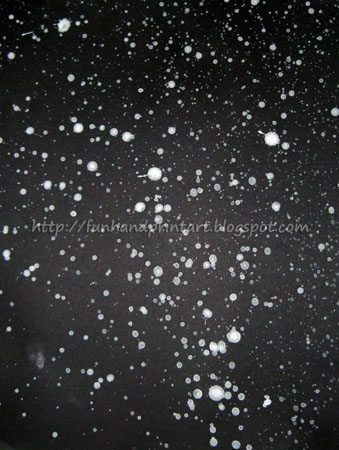 1) I put diluted white paint in a spray bottle and my little guy sprayed it over black paper. To do this, I put the black paper on top of a piece of newspaper placed on the floor and gave him a stool to stand on. Make sure it is spraying in a mist instead of a line. 2) Place a footprint in the middle of the paper slightly more towards the top. We made one white one and one red one. 3) Paint a triangle over the heel and one on each side like shown in the photos.We made red triangles on the white rocket and blue triangles on the red rocket. 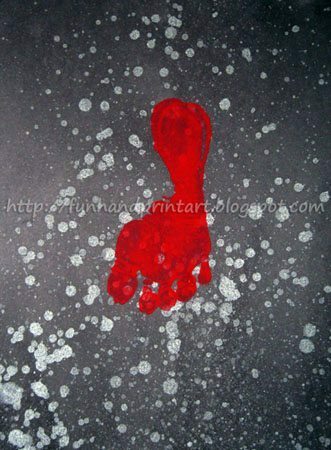 4) Make black dots with either a marker or paint inside the footprint. I made the line of dots equal to the length of each triangle. 5) Print and cut out a cute face of the child into a circle shape. 1 to 3 faces would look good. These create windows for your rocket. 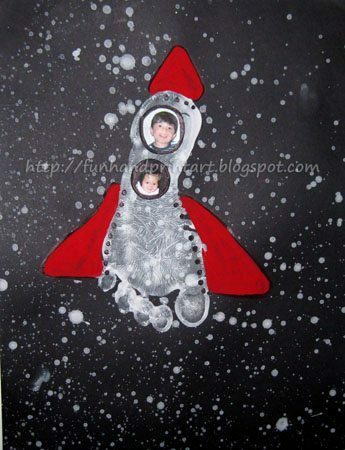 He chose to have his baby sister go to outer space with him. 6) Paint on flames underneath the toes. Variation: If you didn’t want to put faces in, you could paint the windows on instead. 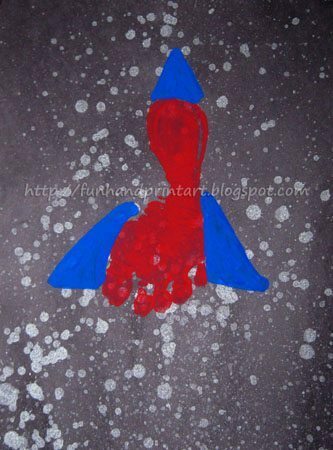 I outlined the triangles with black marker, write something like “3-2-1 Blast off!”, add stars or planets in the background, have the child decorate the rocket however they want give the rocket a name and write it just above the toes. Check out this outer space discovery bottle for another out-of-this-world crafty activity! so cool, have to try this! Super cute! 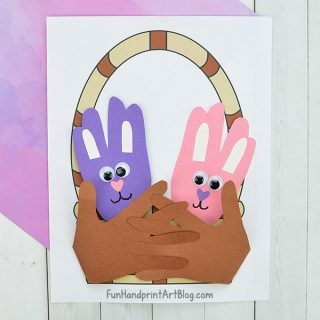 I have been looking for cute hand & footprint art! I am glad I found your website. I am a NEW follower, visiting from Fireflies and Jellybeans blog hop. Hope you have a chance to stop by. Really neat! 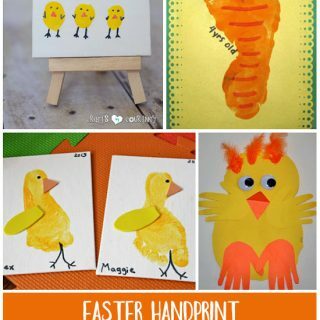 I love all these hand and footprint crafts. 🙂 Thanks for sharing! How awesome is that!?! Love it. Sharing on Facebook.Thanks so much for linking up.